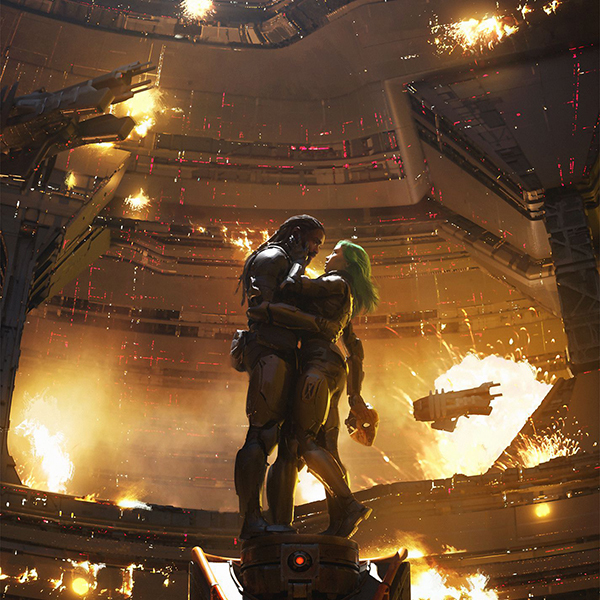 Progressive-rock heavyweights Coheed and Cambria released their 9th studio album, Vaxis – Act 1: The Unheavenly Creatures on Friday, October 5th. Their last album, The Color Before The Sun came out in 2015 but Unheavenly Creatures is their return to a concept album since their last released in 2013 and adds another chapter to The Armory Wars. For anyone new to the band, The Armory Wars is a storyline and comic that was developed by frontman Claudio Sanchez and has been the basis for all Coheed albums and even side projects, excluding The Color Before The Sun. And this album has definitely been worth the wait. Unheavenly Creatures is by far their most well-rounded and complete album. It truly emcompasses everything we’ve heard from Coheed and Cambria in the past, with new techniques that further establishing themselves as one of the most unique storytelling bands of our time. Sanchez’ powerfully emotional lyrics will pull on your heart strings and have you belting out the chorus. A balance of gritty and Intricate guitar work and killer solos like in “Black Sunday” will have you headbanging and pulling out the air guitar. “True Ugly” will be a new favourite with its intense intro, fast paced verses that slow to an emotionally driven chorus only to pick right back up again, Sanchez really shows off his range from deep growls to angelic high notes. While some songs might stray a little from traditional Coheed like “The Pavillion (A Long Way Back)”, starts off softer with a more pop sound but builds up to one of the most beautiful chorus; and will have you screaming along when it erupts; “Hang on it’s clear that that roads about to get rough”. Each song stands on it’s own but the album is at it’s best listened straight through as the song transitions tie into one another beautifully to create the narrative. They paid close attention to detail in creating a universe for the listener; using various instrumental and vocal effects with pedals and synth, we’re transported into another universe. It’s especially evident in songs like “Toys”, “Queen Of The Dark” with screeching guitars in the intro that sound other-wordly and “Night-Time Walkers” that rocks an 80’s horror movie feel from the distortion pedals on the guitar to the robotic sounding voice singing the bridge and underlying synth that sounds like it’s straight out of Stranger Things. They have done an amazing job at building so much tension throughout the album and releasing it at just that right moments, all coming to a bittersweet cliffhanger in “Lucky Stars”, a track starts off slow with acoustic guitar and a string section that peaks with a Slash-esque solo only to leave us begging for more.”Act 1” in the album title hints that we can expect more from the band soon and we can’t wait. The album is full of surprises, from the slow and sentimental to heavy hitting songs that swell and build up to epic bridges and breakdowns. Even if you don’t think you’ll like a song at first the chorus will shift or the bridge will explode and they’ll have you hooked. You’ll easily get lost listening to this album on repeat, finding hints of old favourites like “The Crowning”, “In Keeping Secrets of Silent Earth: 3”, and “Welcome Home” in songs like “Love Protocol”, “The Dark Sentencer” and “All On Fire”. This is hands-down the best and most cohesive album from the band filled with so many new favourites. Take a listen to the album on youtube, spotify, Apple Music or wherever you stream your music and if you love it as much as I do buy it, and check them out on their current tour.